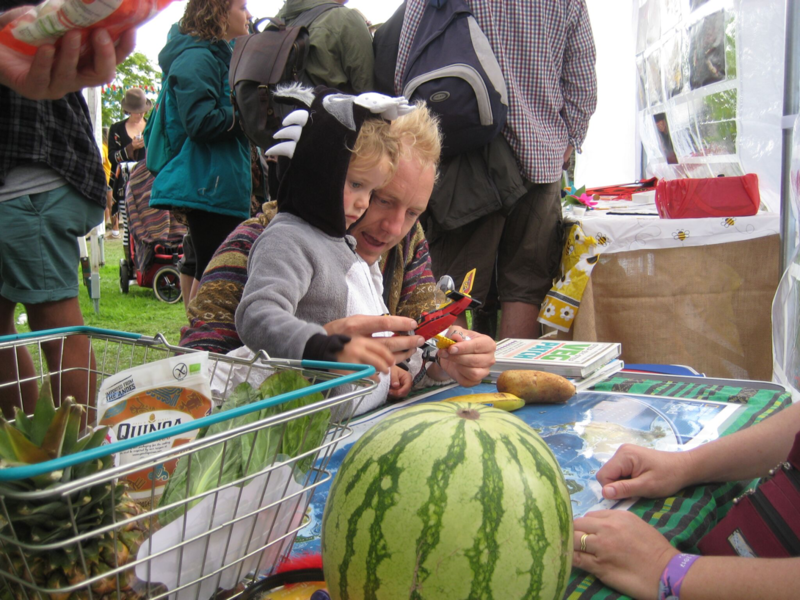 The ‘Plant Power Station’ was a public engagement and scientific outreach project presented at the 2017 Green Man Festival. The event successfully attracted around 3000 participants over the four days. This project was developed by a group of PhD students from across the BBSRC-funded South West Biosciences Doctoral Training Partnership (SWBio DTP). The event aimed to raise public awareness of the importance of plants, pollinators and ‘plugging yourself into a greener world’. 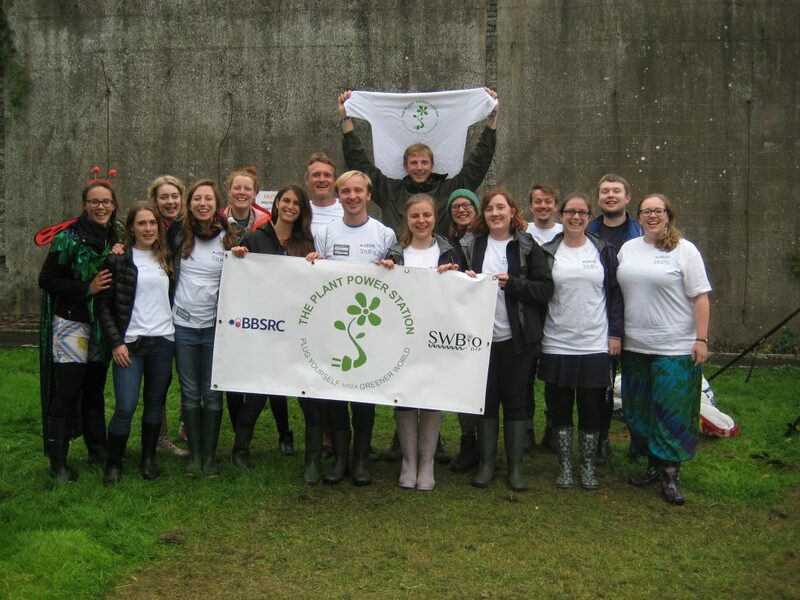 The students, who are all completing PhDs within the Agricultural and Environment Research theme, designed, directed and executed the project which was headed by Kelly Atkins (a final year PhD student at the University of Bristol) and Dr Dan Bebber (Senior Lecturer in Biosciences at the University of Exeter). The event was a collaborative effort with students participating from across the universities of Bath, Bristol. Cardiff, Exeter (the ‘GW4 alliance’), alongside Rothamsted Research. Now where on Earth do potatoes come from? The ‘Plant Power Station’ was designed on the premise of four different interactive games or ‘substations’ (further details below) which focused on how plants ‘power’ our world; participants were encouraged to visit all four substations by being handed ‘tickets’, sheets of paper embossed with wildflowers which allowed attendees to collect a different coloured stamp once they had visited each substation. Substation one was a game designed to explain how pollinators (bees) find flowers to forage for nectar. Substation two aimed to educate the public about where different foodstuffs originated from around the world. Substation three covered “super plants”, that is, plants with important properties and what we could do to enhance plant functionality. Substation four quizzed people about plants and plant-based products. Members of the public were also encouraged to ask questions about “anything and everything” science related – “no question is a silly question” and to start discussions and debates, some of which went on for at least 40 minutes! The feedback from people of all ages was exceptionally positive, with many people exclaiming that the stand was “brilliant fun”, “interactive and engaging”, “full of knowledgeable people” and a “hive of activity”. Many participants also commented on the fact that they learnt new impartial facts, re-contemplated opinions they previously held and were thrilled to engage in conversations they never thought they would have. Dr Dan Bebber (Agriculture and the Environment Research Theme Champion) recalls the exhibit to be a “busy hub of activity from the start of the festival to the finish” with the students enthusiastically promoting Plant Power! 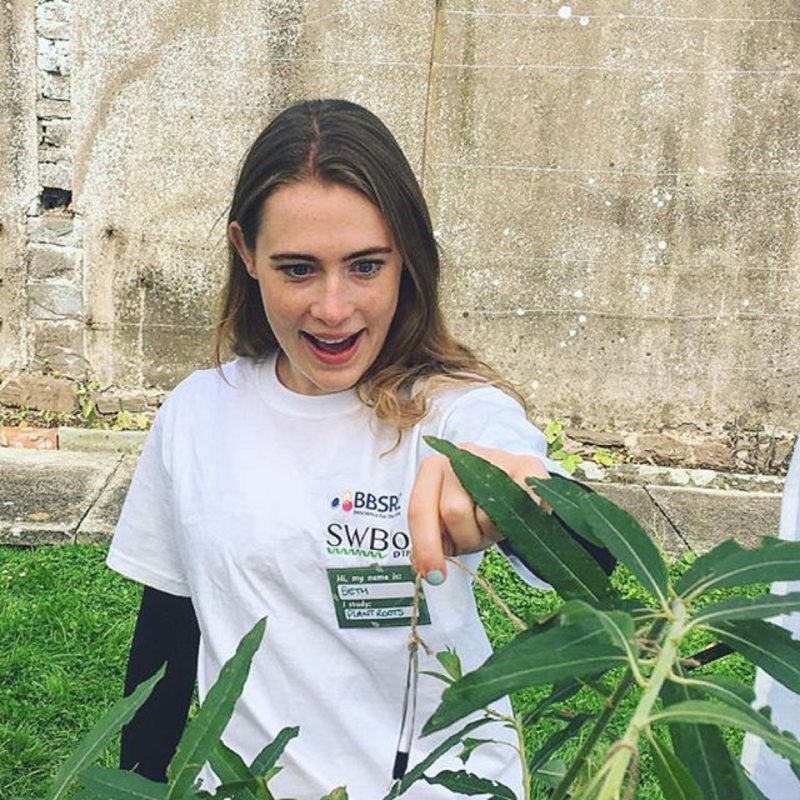 Following success of this outreach project, the team of SWBio DTP PhD researchers would be eager to return to the festival next year since the students document how the project was “fantastically fun”, “rewarding”, a “reciprocal learning experience” which “reinforced why we are doing science when people are interested and engaged in what we do”. The stand focused on engaging the public with bee-mediated pollination. 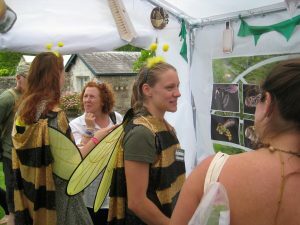 At this station people received a short description of how bees forage for pollen via the ‘waggle dance’ (a dance in which social bees communicate the location of foraging resources to one another), and then participants were presented with different floral essential oils on cotton wool which they were asked to sniff and match to the scent of the felt flowers on the table. This served as a simulation of the translation of information from the waggle dance to successful foraging of nectar from flowers. There were other shorter activities at this station such as showing people UV photographs of flowers, alongside normal photographs, to illustrate how bees perceive flowers differently to humans. The aim of this substation was to educate the public about the origin of different foodstuffs; participants were given a variety of different fruits, vegetables, or other plant-based foodstuffs (e.g. coffee and quinoa) and asked to guess where in the world they originated by placing them on a large world map. A range of different food items were used, from the familiar fruits and vegetables such as the banana and sweetcorn, to more unusual foodstuffs such as dragonfruit. This not only highlighted plant diversity, but it also illustrated that ‘natural’ environments may be the product of human cultivation and familiar species may have been artificially introduced. This stand aimed to educate the public about the extreme diversity of plants and the ‘super-powers’ different plant species possess. A wide range of ‘super-plants’ was used to illustrate this; the plants chosen encompassed both GM and non-GM plants, crop and non-crop species, with the superpowers relating to a range of medical, agricultural or extreme survival properties. Participants were then encouraged to discuss these properties and how they are beneficial to society, or how they may become increasingly important in the future. The participants were then challenged to come up with their own ‘super-plant’ which were collected on cards and hung on a tree; over 700 cards were collected. This station quizzed people’s knowledge about plants and plant-based products, highlighting how we are reliant on plants for almost every aspect of our lives. Participants were asked questions relating to plant products and the quiz was set out on a ‘vertical twister’ board where people placed a limb on an area of the board (marked with A, B, neither or both) which they believed reflected the correct answer. Two different question categories were used: children and adults/teenagers. 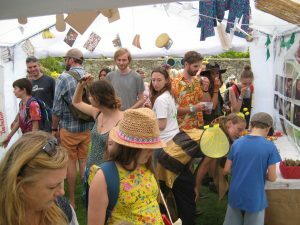 The quiz also drew attention to the ceiling of the gazebo which was decorated with hanging objects/ paper cut-outs representing the extensive range of plant products. Next → Next post: Publication by Rachel Hutchinson looking at how the African tsetse fly really drinks your blood!